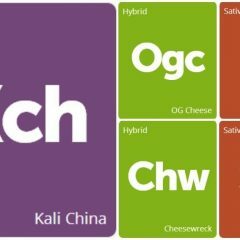 We just added these seven strains to the strain Explorer, and this week's additions feature some potent indicas and newer spins on older genetics. Find out where they're available by clicking the links below, and don't forget to leave a review once you've had a chance to try them! Purple Widow from De Sjamaan Seeds crosses White Widow with the renowned Dutch outdoor strain Purple Power, resulting in a large, sturdy plant that produces fat, resin-covered purple flowers. The aroma ranges from incense to fruit with floral overtones, and the taste from light berry to citrusy. Effects are generally described as combining a strong indica body high with a racy, cerebral sativa feel. Originally bred in the Netherlands in 2007, Purple Widow is not recommended for indoor growing and can reach over 10 feet in height outdoors. A 70/30 indica-dominant hybrid from Dinafem Seeds, Shark Attack is a cross of Super Skunk and White Widow. Though it produces relatively modest levels of THC (12-16%) and significant amounts of CBD, the high is powerfully relaxing and long lasting, and can offer relief from aches and pain. Shark Attack produces a very strong odor of earthy hash with floral and lemon undertones, and tastes much like it smells. 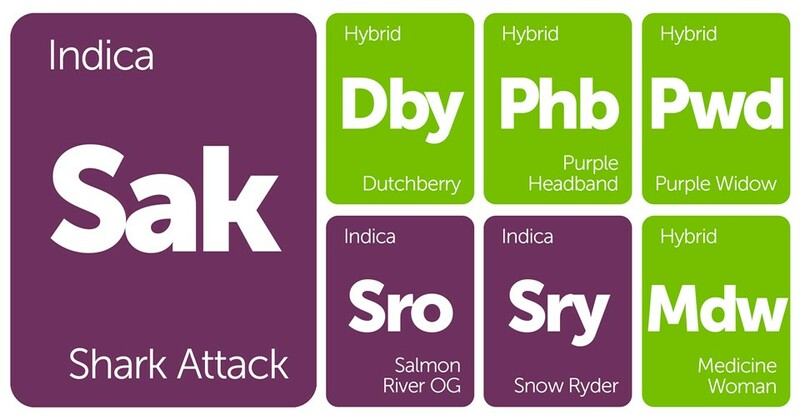 Because it is compact, easy to grow, and high yielding, as well as being suitable for indoor, outdoor, or greenhouse cultivation, Shark Attack is fast becoming one of the more popular hybrids available in feminized seed form. Purple Headband is a 50/50 hybrid strain that combines the famous Headband with an unknown “purple” hybrid, resulting in dense pink and purple flowers covered in greenish trichomes. It often produces a strong fruity aroma with just a hint of gasoline, and a similar flavor with undertones of pine. The high has been likened to that of Headband: uplifting yet relaxing with a warm, fuzzy pressure that gradually creeps from your temples across your forehead. Salmon River OG is an indica-dominant strain from Oregon breeders Dynasty Genetics, who combined a Pre-98 Bubba Kush clone with a carefully selected Blue Heron male, creating a potent and easy-to-grow plant that finishes flowering in 7-8 weeks. The Salmon River OG may provide excellent pain relief and a heavy indica buzz; it is recommended that novice users take care not to overindulge. Dynasty has noted three main phenotypes in this cross, all with a similar terpene profile: a strong berry scent, underlined with hints of chocolate, coffee, lemon, and gasoline, and a similar taste when vaporized or smoked. Medicine Woman is a 60/40 sativa-dominant hybrid strain from renowned Oregon medical cannabis grower David Verstoppen. Aiming to help treat the symptoms of his wife’s fibromyalgia, Dave crossed Purple Urkle Dynamite, and Medicine Man to create this potent hybrid. Measured at over 23% THC, it relaxes muscles and provides powerful pain relief along with an energetic, clear-headed high. The aroma of Medicine Woman is sweet and skunky, and it tastes of sour citrus and diesel fuel. Snow Ryder is an indica-dominant auto-flowering strain available only in feminized seed form from Sensi Seeds. Unlike many auto-flowering strains, Snow Ryder is not a dwarf, so these sturdy plants can grow as tall as four feet while still featuring short internodal spacing. It produces tight, resinous buds covered in sparkly trichomes that have a sweet-spicy, earthy, citrus flavor. The effect of these flowers is described as a deep body stone accompanied by a breezy head high. Browse through other new strains that were added recently to the Leafly Explorer or check out last week's newest additions! 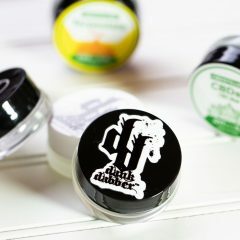 CBD Isolate From the Internet: Is It Worth the High?